You may already know that using TalentHarness to recruit gives you a big advantage in terms of exposure to your open jobs, but we just released a feature that allows you to gain even more exposure: Sponsored Listings. 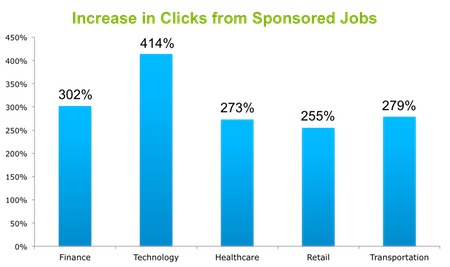 A few of our partners (Indeed, Simplyhired, JobG8) have paid options which are designed to maximize your exposure through a pay-per-click system whereby the job poster pays for each target (job seeker) that comes through to view your advertisement as a result of a click through. You may understand pay-per-click or you may not. Either way it's kinda time consuming to get setup with and manage each week or month. And to have manage it across multiple sites is pretty much out of reach for most folks. That's why we decided to take the management hassle out of it and offer a few different options which will get our users who are willing to put forth some advertising dollars significantly more traffic. Our options work like this: Once you post a job you will encounter the PowerPost option. There are currently 4 options to choose from depending on your budget. The fee is paid upfront similar to a traditional advertisement but we will then feed your job into the sponsored listings with our partners (currently indeed.com, simplyhired.com, juju.com, and jobg8.com) and manage the PPC campaign on our end. You get the benefit of significantly higher exposure without the hassle of managing the campaign. SimplyHired, one of our partners recently published a chart showing the exposure benefit of using the paid option. Let us know if we can answer any questions about the new feature. We want your hiring to be a success!